Last week I went over to the University of Liverpool to give a seminar in the Department of Geography and Planning. It was a friendly event and I tried out a new talk on the historical geography of the helicopter and unrealised planning for city centre heliports in the 1950s. This is a fairly new strand of research coming out of the broader Mapping Manchester project and more directly from the successful Infra_MANC exhibition that I co-curated last spring. 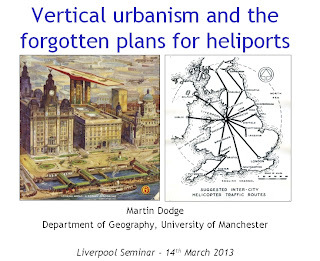 I am giving an amended version of this heliport talk at a one-day workshop in Birmingham next week on Infrastructure and the Rebuilt Post-war City, where I will drop the Liverpool-specific examples and add in a little bit more on London and Birmingham. I plan to write this material up as a full paper in the next few months, but in the meantime you might want to read the 'helicopter dreaming' chapter in the print catalogue from our Infra_MANC exhibition - copies still available for just £10.